ARLINGTON, VA; April 26, 2012 – PBS unveiled today an expansive summer line-up featuring a diverse array of new programming. Shows premiering this summer include the PBS ARTS SUMMER FESTIVAL, a seven-part celebration saluting arts and culture from the Middle East to South Texas; the debut of MARKET WARRIORS, a major new series that focuses on nationwide treasure hunts for flea market finds; QUEEN & COUNTRY and MICHAEL WOOD’S STORY OF ENGLAND, two shows that highlight British history and tradition just in time for the 2012 Olympic Games; and PBS ELECTION 2012, which includes full primetime coverage of the Republican and Democratic Conventions from PBS NEWSHOUR. 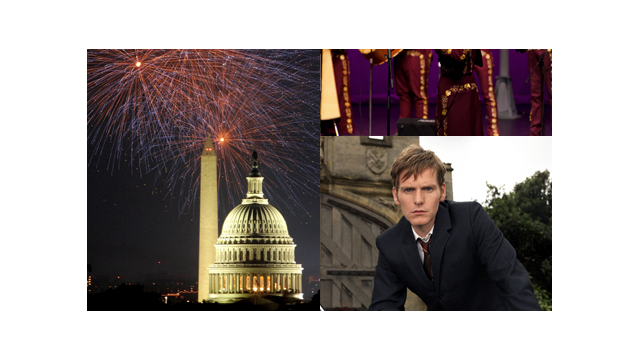 New episodes of PBS favorites also debut this summer, including a star-studded gala on A CAPITOL FOURTH; compelling independent documentaries from INDEPENDENT LENS and POV, now celebrating its 25th anniversary; new investigations on HISTORY DETECTIVES; new MASTERPIECE MYSTERY! productions; and updates to vintage episodes of ANTIQUES ROADSHOW. QUEEN & COUNTRY and MICHAEL WOOD’S STORY OF ENGLAND The PBS mega-hit MASTERPIECE CLASSIC “Downton Abbey” made all things British hip in America. Amid the 2012 Summer Olympics in London, and following closely on the heels of the Queen’s Diamond Jubilee celebration, PBS presents two new series that focus on Her Majesty and the history of her country. PBS ARTS SUMMER FESTIVAL PBS keeps its attention on the arts with the seven-part PBS ARTS SUMMER FESTIVAL, giving viewers front-row seats and backstage passes to the very best arts programming. Following the first PBS Arts festival last fall, this new season, beginning June 29, includes a series of independent films that highlight a diversity of artistic disciplines and subjects. The kick-off film, MARIACHI HIGH, is the heart-warming and heart-wrenching story of South Texas student musicians whose award-winning Mariachi band is a source of civic pride and rigorous discipline. The Festival closes August 10 with a spectacular concert celebrating Tanglewood Music Festival’s 75th Anniversary. Located in the Berkshire Mountains of western Massachusetts, Tanglewood is one of the world's most beloved music festivals. The performance, a presentation of GREAT PERFORMANCES, will feature appearances by the Boston Symphony Orchestra (BSO), the Boston Pops, the Tanglewood Festival Chorus, the Tanglewood Music Center Orchestra — led by conductors John Williams, Keith Lockhart and Andris Nelsons — and iconic Tanglewood artists Emanuel Ax, Yo-Yo Ma, Anne-Sophie Mutter, Peter Serkin and James Taylor. The wide-ranging program, which will be taped on July 14, will include Aaron Copland’s “Fanfare for the Common Man”; Leonard Bernstein’s Three Dance Episodes from On the Town; selections from the Great American Songbook; Franz Joseph Haydn’s Piano Concerto in D, 2nd and 3rd movements; Pyotr Ilyich Tchaikovsky’s Andante cantabile for cello and strings; Pablo de Sarasate’s Carmen Fantasy, for violin and orchestra; Maurice Ravel’s “La Valse”; and Ludwig van Beethoven’s Choral Fantasy. •GREAT PERFORMANCES “Tanglewood 75th Anniversary Celebration,” August 10, 2012, at 9:00 p.m. ET. Producers: John Walker and Mitch Owgang. Series Producer: Bill O’Donnell. Executive Producer: David Horn. PBS ELECTION 2012 PBS’ on-air and online news and public affairs programs — PBS NEWSHOUR, FRONTLINE, WASHINGTON WEEK WITH GWEN IFILL and NEED TO KNOW — together provide intelligent, independent and in-depth coverage and analysis of the 2012 presidential campaigns, the candidates and the key issues affecting voters. A recent study by Public Policy Polling showed that PBS remains American viewers’ most-trusted news source on television. This summer, PBS will provide gavel-to-gavel coverage of the conventions as well as ongoing, up-to-the-minute coverage of election news. Additionally, CHARLIE ROSE and TAVIS SMILEY will feature election-related guests and content. “Giant Squid”: Examine one of the biggest, yet most mysterious animals on Earth — the giant squid, a deep-sea animal that has never been observed in the wild. “Camel”: Brave the baking desert with scientists Mark Evans and Joy Reidenberg as they dissect a camel to uncover the features that allow it to adapt and thrive in the dry desert environment. Filmed over 20 years by acclaimed documentarian Jennifer Fox, “My Reincarnation” chronicles the epic story of exiled Tibetan Buddhist master Chögyal Namkhai Norbu and his Western-born son, Yeshi. With intimate access to both the family and the Dalai Lama, Fox distills a decades-long drama into a universal story about love, transformation and destiny. “The Soul of Genius” – July 8 When the body of an obsessive Oxford English professor is discovered ritually buried, Lewis and Hathaway are set upon a seemingly impossible quest to uncover the truth. James Fleet (“Little Dorrit”) and Celia Imrie (“Cranford”) guest star. “Generation of Vipers” – July 15 Suspicions abound as Lewis and Hathaway investigate the death of a lovelorn Oxford professor. Was her death caused by an embarrassing internet leak or something much more sinister? Toby Stephens (“Jane Eyre”) guest stars. “Fearful Symmetry” – July 22 Lewis and Hathaway are drawn into a darker side of Oxford while investigating the murder of a suburban babysitter. “The Indelible Strain” – July 29 A controversial American academic is found strangled after a guest lecture at Oxford, leading Lewis and Hathaway to narrow down a list of motives that includes politics, ambition and vengeance in order to find their culprit. “An Event in Autumn” – September 9A disturbed young woman falls from a ferry. Wallander suspects suicide until the body of another female turns up in his garden. Saskia Reeves (“Page Eight”) guest stars. “The Dogs of Riga” – September 16Murdered drug-runners from Latvia turn up in a boat in Swedish waters, sending Wallander to Riga to probe a series of torture killings. Rebekah Staton (“Tess of the D’Urbervilles”) guest stars. “Before the Frost” – September 23A religious cult bent on violent retribution brings Wallander together with his estranged daughter Linda. Jeany Spark (“Sherlock”) guest stars.